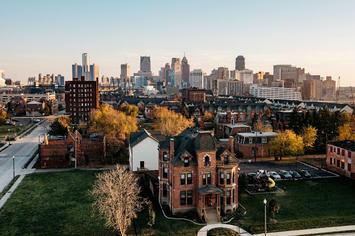 You may have heard that Detroit is in the midst of a modest but enduring revival in and around its downtown. Residents and businesses are returning to the city, filling long-vacant skyscrapers, prompting new commercial development and revitalizing adjacent old neighborhoods. As a former Detroiter I'm excited to see the turnaround. After so many false starts, Detroit's post-bankruptcy rebound seems very real. However, there seems to be a growing awareness that the city's current revival has its limits. On one hand, what's happening now in Detroit could be considered a rather elongated recovery for the city instead of growth, as the city races to catch up with cities that have had a 20-year head start on urban revitalization. One could argue that the Motor City is slowing losing its taint, and the investment that's coming to the city now is investment that never left, or never left at such a scale, in other cities. Maybe its reclamation rather than revitalization. But more broadly speaking, there's a sentiment that the city's revival hasn't been inclusive. In a majority-black city, startlingly few African-Americans appear to be involved in the rebound, either as developers, homebuyers or even consumers of new amenities. Because of this, two vastly different kinds of fears seem to trouble much of the city's black community -- the revitalization could burn through the city like a wildfire and lead to widespread displacement, or the rebound could peter out before it has a chance to transform even more of the city. How can that be? Maybe because people and businesses are coming back not because of an economic change in the city, but a socio/cultural one. Detroit is still the Motor City, and that won't change anytime soon. Detroit will remain the headquarters of American auto production and be a key manufacturing center for generations to come, and it will continue to ride the wave of manufacturing ebbs and flows. That's why I say the economy is driving little of what's happening in Detroit today. The Big Three are only eight years away from a true existential threat, and are still in the process of righting the ship. By my eyes, Detroit still hasn't found a new economic raison d'etre that could vault it into the next phase of its development. As the fears that drove white and middle-class flight from the city from the 1960's onward recede into the distant memory, many people are willing to reconsider Detroit and return. Detroit is at an interesting juncture in its history. After 125 years of focusing on its national and global economic prominence and leaving city-building behind, maybe now Detroit can focus on being a thriving, livable city. For everyone. There is an opportunity for Detroit to build on its rich urban design legacy to include more of the city, and more of its people, in its revival. There is an opportunity to set the stage for good -- even innovative -- urban development in the Motor City as the city continues to search for a new economic catalyst. I believe the city should undertake a capital improvement/revitalization plan that utilizes its grand arterial streets -- Gratiot, Woodward Grand River and Michigan avenues -- and Grand Boulevard, the parkway necklace around the city's inner core, as assets and foundations for growth. 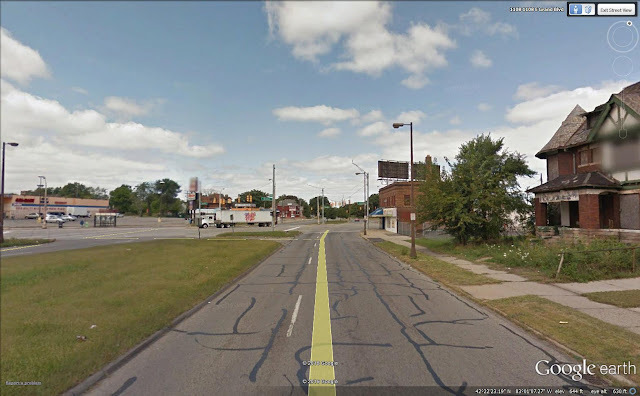 After that, the city could extend similar improvements to the locations where the arterial streets intersect with the defunct Detroit Terminal Railroad, further out from the city center. Finally, the improvements could be extended even further outward to Detroit's other boulevard necklace, Outer Drive, near the city limits. Just as interstate highway development had the net impact of opening up outer bands of suburbia to city residents, this plan could open up languishing parts of the city for revitalization. 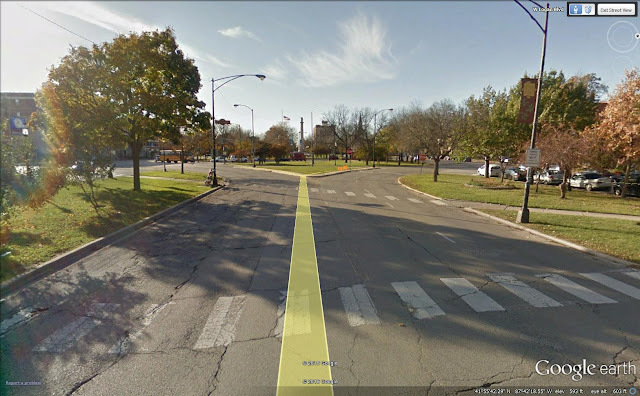 • Transform Gratiot, Woodward, Grand River and Michigan avenues into true boulevards -- landscaped medians, streetscaping, wide sidewalks, bike lanes, etc. -- from their sources in downtown Detroit to their intersections with Grand Boulevard. 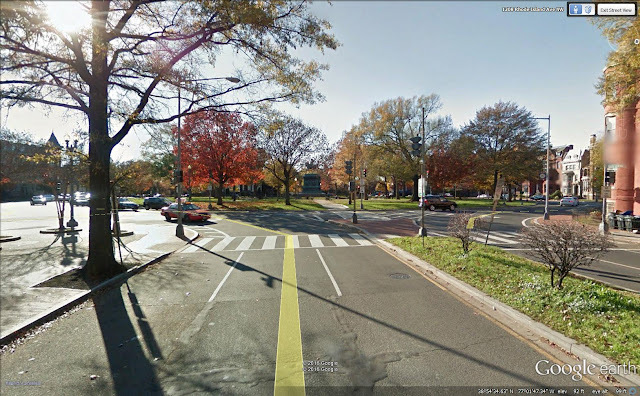 • Establish public squares where each new boulevard intersects with Grand Boulevard. • Develop a connected greenway along the path of the former Detroit Terminal Railroad. 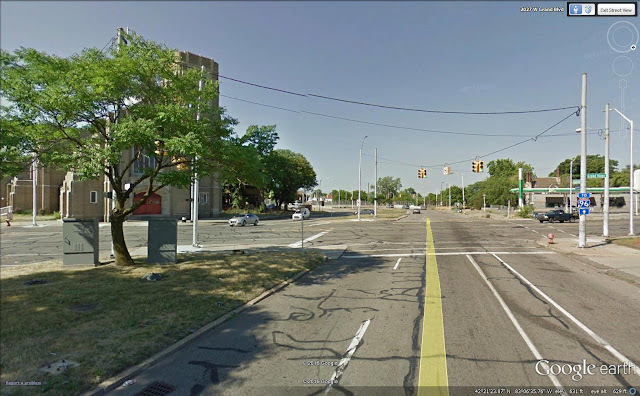 • Extend boulevard treatment along Gratiot, Woodward, Grand River and Michigan avenues to a new terminus at Outer Drive. • Complete and connect Outer Drive where necessary, and establish new public squares where the boulevards intersect with Outer Drive. Each step of the plan would include zoning changes along the affected areas with the intent of increasing residential and commercial development choice, and send a signal that the city is ready for transformation. First, please excuse my crude Microsoft Paint illustration. Hey, it serves its purpose. Second, let's consider the broad areas of the city highlighted in various colors. The green areas are the downtown and downtown-adjacent areas that have been experiencing a pretty significant rebound over the last 5-10 years. In fact, you could say that revitalization took hold there with the opening of the Comerica Park baseball stadium in 2000 and the Ford Field football stadium in 2002. This area also includes the Midtown area north of downtown that includes Wayne State University and a host of city cultural institutions. The orange areas are the parts of the city that capture the dystopian imagination of Detroit. This area is quite -- but not totally -- abandoned, where much of the city's older residential and industrial treasures have been lost. There's still some intact neighborhoods that have a solid walkable foundation, but they're often disconnected from each other by some serious abandonment. The yellow areas are the areas that might be described as imperiled; they could soon look like the orange zone if action isn't taken, and in fact some parts of it (like the Brightmoor neighborhood, on the far west side, are quite abandoned already). The gray or uncolored areas on the far northeast and northwest edges of the city represent the most stable residential neighborhoods of the city, but they, too, are threatened by the challenges experienced by the rest of the city. 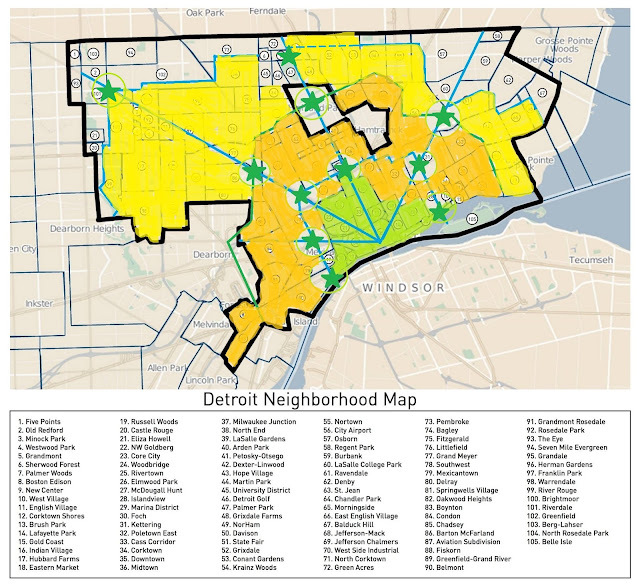 When you hear Detroiters expressing concern that downtown revitalization isn't reaching the neighborhoods, they often come from the yellow and gray/uncolored areas, with fewer and fewer voices coming from the relatively open orange areas. Viewed this way it can be understood that people see the city's rebound as having a low ceiling; there is a half-empty quarter that sits between them and the promise of revitalization. My idea is to utilize strategic infrastructure investment and zoning reform to attract new development to key corridors, utilizing the city's radial network. The radial blue lines on the map emanating from their intersection downtown represent (clockwise, from the left) Michigan, Grand River, Woodward and Gratiot avenues. The blue line that connects them, just outside the green revitalization area, is Grand Boulevard. The blue line that connects the radial streets further out is Outer Drive. The green stars represent public squares or plazas that could be built, and the light green circles indicate an approximate extent of impact outward from the squares or plazas. The green line that serves as the dividing line between the yellow and orange areas is the Detroit Terminal Railroad, and it would become a connecting trail. This was a missed opportunity for Detroit to have majestic entryways into neighborhoods beyond the city center. This was also a missed opportunity to develop areas that could become more mixed use and multifamily in character, as opposed to the dominant single-family home city that Detroit is today. The public squares on the radial avenues could have the effect of drawing development and revitalization outward from the city center, as has happened in Chicago and DC. This could continue outward to the DTR trail and Outer Drive, if the city sees success in such a measure, finds the appropriate resources and desires to extend it further. Detroit should certainly see the merits of such an investment. The city renovated and rededicated a new Campus Martius Park in 2004, and it has become a focal point for downtown revitalization. Without a doubt, this would be a costly measure, maybe even a folly for a city just out of municipal bankruptcy and still struggling to provide basic city services. that's why I would envision this as a long term proposal, perhaps a 10-year project. That's the basis of the idea. I'll follow up with more details soon.